Wesołego Alleluja -- Happy Easter ! Peter: Easter is coming soon and for most Poles it is one of the two biggest religious celebrations of the year. I love the traditional foods and delicious sweets such as the sweet Walnut Mazurka pictured here. Laura: As Peter’s parents grew older, preparing the food and keeping up tradition became my job. Laura: And you do such a good job! 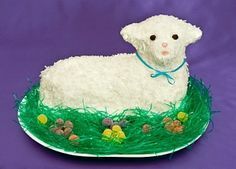 Then there is the butter lamb. Most of the time Peter’s Mom would buy one at a Polish deli and it rested in the freezer until the big day. It always sat on the table next to a chocolate rabbit. Peter: Growing up I always had to bite into that rabbit’s head to see if it was hollow or solid. If it was hollow, shards of chocolate would get all over the white tablecloth and I was in big trouble! Laura: A few years ago I found a lamb mold and I’ve been making my own Easter lambs…but you must be careful to fill the mold completely, otherwise we would end up with a deformed lamb – not a pretty sight. Many Polish deli’s still carry butter lambs or you can find one on-line. Laura: .. which is served hot in my best, elegant, china cups. But the rest of dinner is served chilled or at room temperature. There’s always a ham, Polish Vegetable Salad, several varieties of Polish kielbasa, and on the side we always have a delicious mild mustard sauce plus Cwikla- a relish made of chopped beets and horseradish. Easy to make: just 5 parts finely chopped beets and one part prepared horseradish – m ore or less depending on how hot you like it. Peter: I always go for the big flavors so when Laura is not looking, I’ll sneak in an extra tea spoon of horseradish. Years ago my Mom always got an imported Polish ham because it was a lot leaner and had a milder flavor than American brands. Back in the day, it was said that Polish pigs were fed potatoes which gave them that milder flavor. Laura: These days we go for a honey-glazed spiral sliced variety, just because it’s easier. 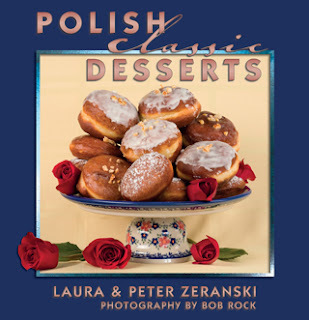 Peter: Desserts used to include one or two Mazurkas, a Baba, and occasionally Grandma’s cheese cake. These days we’ve cut back on the sweets but here is a Baba recipe that we particularly like because of the rum icing. Laura: The batter is made from margarine, sugar, eggs, flour, baking powder, milk, orange rind and raisins. Place all the ingredients in a bowl, beat it with a mixer or 5 minutes and bake in a well-buttered 8-inch fluted ring pan, at 350 degrees for 45 minutes. Peter: The icing is just simple syrup, orange juice, some white rum, candied orange rind and maybe some orange zest. Transfer the warm cake from the baking pan onto a serving plate and immediately pour the icing slowly over the top, letting it drip down the sides. Sprinkle the top with orange zest. Let it cool before cutting. Soo good! Here is the full recipe for this Baba. 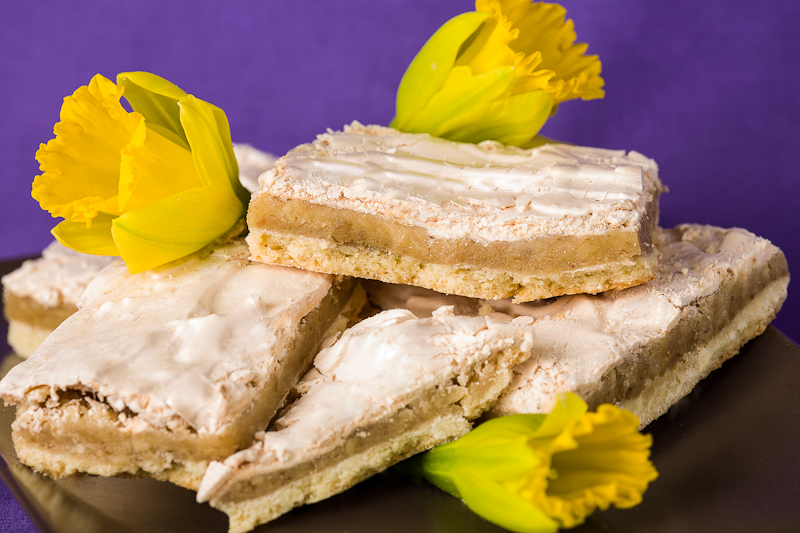 And there are several other delicious Easter treats in our Polish Classic Desserts book. Batter – Place all the ingredients in a bowl and beat with a mixer for 5 minutes at medium speed. Bake in a well-buttered 8-inch fluted ring pan at 350 degrees for 45 minutes. Icing – Add the sugar to the water in a heavy pan and cook until it becomes a heavy syrup. Add the orange juice and rum. Remove the warm cake from the pan onto a serving plate and immediately pour the icing slowly over the top, letting it drip down the sides slightly. For a splash of color, sprinkle with bits of candied orange rind or orange zest. Cool thoroughly before cutting.